It’s that time of year again! 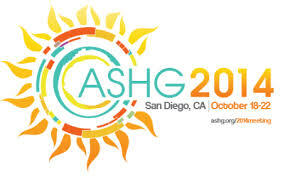 If you are headed to sunny San Diego for ASHG please be sure to stop by booth #1114 to say hello, ask questions and check out a demo of the newest DNAnexus features. We’ll also be hosting a panel discussion (free lunch!) with experts from the pharmaceutical industry and healthcare to academia, who will talk in-depth on how they are actually bringing together genomic and phenotypic data. The premise of this panel is that the new bottleneck in genomics is colliding rich datasets (e.g. NGS data with phenotypic data). While we have moved beyond the challenges of reading, storing and processing DNA sequencing data, we have entered a new phase where the next wave of advancements will come from projects where diverse sources of data are integrated and interrogated collectively. The conversation will cover technical innovations and specific approaches with a focus on what is working and why, along with challenges encountered and how they are being addressed. David Shaywitz, MD, PhD, DNAnexus CMO & Co-Author, Tech Tonics: Can Passionate Entrepreneurs Heal Healthcare With Technology?